From left, Peoples’ Self-Help Housing President/CEO John Fowler, PSHH Fund Development & Communications Director Rochelle Rose, Event Committee Chair Vicki Young, and Emcee Andrew Firestone enjoy the Taste of Hope Gala and Auction at the Santa Barbara Historical Museum. 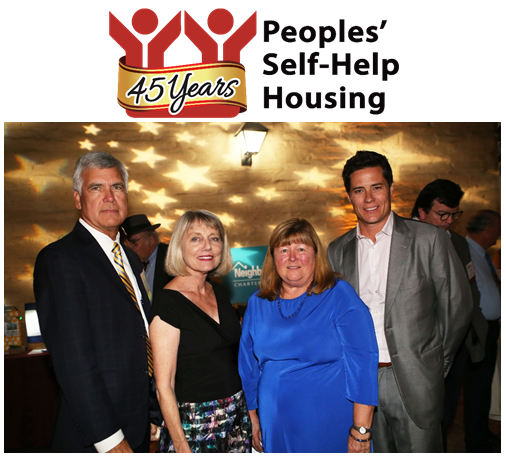 Santa Barbara, Nov., 2015 – Peoples’ Self-Help Housing (PSHH) celebrated its 45th Anniversary at the affordable housing provider’s Central Coast Taste of Hope dinner and auction gala on Nov. 13, 2015, collecting over $106,000 in sponsorships, plus $30,000 that was raised that evening. Businessman and reality television personality Andrew Firestone emceed the event at the Santa Barbara Historical Museum, celebrating PSHH’s sapphire and gemstone anniversary. The Taste of Hope served as a thank you to the supporters who helped PSHH grow from a small community initiative in San Luis Obispo to an award-winning nonprofit and the largest affordable housing developer on the Central Coast. Peoples’ Self-Help Housing has developed over 1,600 affordable rental units housing more than 5,000 low-income residents. PSHH has also assisted nearly 1,200 low-income self-help home builders build and own their own first home. The gala featured a gourmet dinner by Chef Michael Hutchings, live entertainment by A la Carte and dancing under the stars in the Museum’s Adobe Courtyard. PSHH residents, including Arturo Gallegos from the Victoria Hotel in Santa Barbara, and 19-year-old Juana Delgado speaking on behalf of the Delgado family from Villa la Esperanza Apartments in Goleta. Guests enjoyed wines from Grassini Family Vineyards and The Sanger Family of Wines: Consilience, Marianello and Tre Anelli. Island Brewing Company was also pouring beer samplings. Westerly Orchids supplied beautiful sapphire-blue colored orchids. Honorees at the Taste of Hope included Volunteer of the Year Sharon Turner, Corporate Sponsor of the Year Yardi Systems, and Donors of the Year Goleta Valley Housing Committee and Mike and Jennifer Payne. PSHH would also like to thank the Taste of Hope Honorary Co-Chairs Richard Heimberg and Karen Schloss Heimberg, and Alyce and David Boyd. Vicki Young, of LaunchPoint Technologies of Goleta served as the event chair. Event sponsors included Neighborworks, Pacific Western Bank, Union Bank, Bank of America/Merrill Lynch, Chase Bank, Citibank, Santa Ynez Band of Chumash Indians, Lash Construction, Merritt Community Capital Corporation, Arthur Gallagher Risk Management Services, Coastal Community Builders, Community Economics Inc., Curry Roofing, Montecito Bank & Trust, and U.S. Bank. Other sponsors included Ashley & Vance Engineering, Bobbie and Gerry Rubin, Carroll Building, CSA Architects, Efren Fajardo Painting, Foundation for Santa Barbara City College, Gray & Troy Insurance, Gubb & Barshay LLP, Housing Authority of the City of Santa Barbara, Izabal Bernaciak & Company, Rabobank, Stantec, Richard Heimberg Construction, St. Vincent’s, Thomas Electric Company, Tom and Nancy Crawford, Wells Fargo, and many others. Andrew Firestone is an American TV reality show personality and businessman. He is Principal and Founder of StonePark Capital, a Santa Barbara based hospitality firm that focuses on the acquisition and development of select service hotels. Founded in 1970, PSHH is an award winning non-profit organization that develops affordable housing and community facilities for low-income households and homeownership opportunities for working families and special needs populations, such as seniors, veterans, the disabled, and the formerly homeless. With nearly 1,200 self-help homes completed and over 1,600 rental units developed, PSHH is the largest affordable housing developer on the Central Coast, with offices in Santa Barbara and San Luis Obispo. For more information on Peoples’ Self-Help Housing, visit www.pshhc.org, phone (805) 699-7220.